The Home Depot opened its first stores in Atlanta, Georgia in 1979. It is hard to believe that in just 40 years, the company has become the largest specialty home improvement retailer in the world. With 2,200 stores, the corporation employs 400,000 employees in positions ranging from drivers and sales associates to human resource and IT professionals. There are stores in every U.S. state, the District of Columbia, Puerto Rico, the U.S. Virgin Islands, Mexico, and 10 Canadian Provinces. Irrespective of your educational background, experience, and interest in home interest, The Home Depot has a job for you. Due to the company’s continuous growth, both corporate and retail job seekers have a good chance of finding local employment opportunities. The company’s website offers information about careers in retail, distribution, merchandising, contact center and corporate, as well as opportunities for veterans and students. Retail: For in-store opportunities, The Home Depot seeks candidates with some knowledge or experience in the home improvement or retail field. Associates are expected to have strong customer service skills, written and verbal communication skills, the ability to sell products, and excellent interpersonal skills. Distribution jobs and other labor-intensive roles require more physically capable employees due to the nature of the work. Though the Store Support Center (SSC) in Atlanta, GA is the company’s central corporate hub, there is also division and functional offices across the country. Internships: The Home Depot offers a paid summer internship program that is ranked as one of the 50 Best in the nation by Vault. Interns benefit so much from them because of the impactful projects they are assigned and valuable career guidance they receive. Also, many interns receive full-time job offers from The Home Depot. There is also an Assurance & Advisory Management Program for interested and qualified candidates. Interested candidates should apply in the fall of the preceding year, as spots fill up quickly. 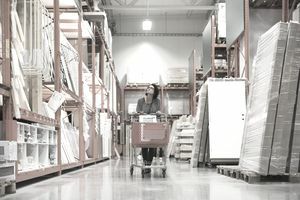 Career Planning: Home Depot encourages long-term commitment from their employees in many ways. The company rewards performance, innovativeness, and motivation. They have a keen interest in helping people build a career with the company and organizing career paths in an easily navigable way. 90% of store leadership employees were initially hourly associates. You will find tools and mentors to help you decide what jobs will be a good fit, how to excel in the position, when it’s time to move up the ladder, and how to make the next step. Job Application: Applicants can search for employment opportunities by location, keywords, job type and job category. After finding the position that interests you, apply online by creating an account with a username and password. You will then fill in the necessary information, including your current address and contact information, availability, education, employment history (including addresses, phone numbers, supervisor names and titles, salary and dates of employment) and driver's license number. Applicants also have the option of applying in person at their local Home Depot store. Company Benefits: Depending on your position and tenure with Home Depot, you may be eligible for benefits. They can include health care plans (medical, dental, and vision), financial protection (life insurance, critical illness protection, accidental death insurance, auto/home/veterinary pet insurance), financial (401k, employee stock, credit union, health savings account), paid time off, and work/life balance programs. Career Events: You’ll find representatives from The Home Depot stores, corporate offices, and supply chain organization at many career events throughout the year. Making personal contact with recruiters at these events can be beneficial. They will answer questions you may have about the company and the application process, and they may be able to refer you to contacts in the location and department that you are interested in. Bring a copy of your resume, dress appropriately, and mention any positions you have applied to online.